We talk a lot on this podcast about how to navigate book pregnancy—but what do you do if you’re not yet pregnant with a book? We explore three situations that create this kind of experience and offer helpful, practical ideas for living into this reality. Check out Bookwifery’s new website! In last week's episode, we talked conceptually about how to birth a book, with an emphasis on tending your book, your voice, and your audience. This week we get into the nitty-gritty—and a free checklist gets you started and is available for download. We've asked if it's time for you to birth a book. Now let's talk about how to actually do it. In this episode, we cover the core concepts and milestones that go into birthing a book. 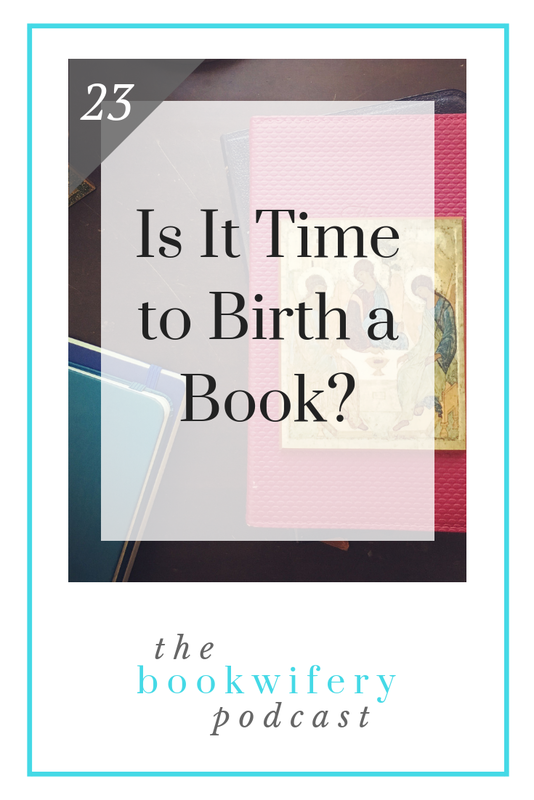 Is birthing a book for you? What are some of the markers that would tell you it might be time? What are the benefits of doing this? We break it all down—with examples—in this episode. Has some significant life event cropped up and affected your progress on your book? Has your energy for the book shifted, rendering it hard to keep going? Does life keep getting in the way? Let's talk about what to do when your book project just isn't going to plan. We talk a lot about discernment, but what does it actually look like? How do you discern? What’s the process? In this episode, we look at five possible approaches to discernment—plus the helpful prep work that can ready you to discern. Do this; do that. Don't do this; don't do that. So many rules! What's truly required when it comes to book pregnancy? Where do you have choices or the opportunity to discern your true invitations? In this episode, we unpack the realities of what's required and what's discerned in the experience of book pregnancy. It's Bookwifery's second birthday! Let's mark the occasion with a bonus episode, shall we? In this episode, we explore the application of real-life pregnancy experiences to the experience of birthing a book. In particular, we find five connections worth learning from—plus the difference a midwife can make. If you know you're not writing memoir but still have stories to share, is that okay? The answer is yes! Personal storytelling can elevate your reader's experience of your general nonfiction book. In so many ways, your knowledge and ideas are the just the beginning. When you've lived through a significant live event, the impulse to share your experience is strong. Something so major and all-encompassing wants to be shared. But does it want to be shared as a memoir or as a general nonfiction book—a book that more directly seeks to help people? Let's find out. You've likely heard of the concept of an ideal reader, but did you know two other types of readers exist? What role can they play—positive or negative—in your book and your work? And what's the most important thing to keep in mind in all of this?